22/10/2009 - Widespread drought, falling agricultural production and rising sea levels are just some of the devastating effects of climate change graphically illustrated in a new map produced by UK government’s Meteorological Office. 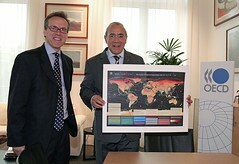 The map, which has been presented to OECD Secretary-General Angel Gurría by the British Ambassador to the OECD, Dominic Martin, shows the likely impact on the planet of a 4 °C rise in the global average temperature. The map, prepared ahead of crucial UN climate change talks in Copenhagen in December, illustrates how the effects of climate change would differ from region to region. "We welcome this initiative of the UK government,” said Mr Gurría. “This constitutes an invaluable contribution to raise awareness of the size of the challenge. It has the particular merit to be easily understandable. “The scientific evidence is overwhelming, the economic logic is compelling, and the costs of inaction are frightening. Thus, we have no choice, we must act now." OECD analysis suggests that unless action is taken, global greenhouse gas emissions will rise by about 70% between now and 2050, and by 2100 there could be 4-6 C global mean increase in temperatures above pre-industrial levels. The map shows that, for instance, as the Himalayan glaciers melt, 23% of the population of China could be deprived of the vital dry season glacial melt water by 2050. It explains too that an estimated mean sea-level rise of 53 cm by 2075 would result in floods affecting an additional 150 million people, with Asia being particularly badly hit. Further information about the work of the OECD on climate change and the UN Framework Convention on Climate Change (COP15) can be found at: www.oecd.org/env/cc and www.oecd.org/env/cc/cop. Journalists are invited to contact Jan Corfee Morlot (tel. +33 1 4524 7924). Further information on the UK Meteorological office climate change map can be found at: www.actoncopenhagen.decc.gov.uk/4degrees.